Rance Mulliniks was one half of our legendary platoon at third base. He shared the duties with Garth Iorg for most of the 80s before Kelly Gruber took over. Rance was a fan favourite because he didn't look like an athlete. Nobody accused Rance of juicing, unless he was juicing that killer moustache. He was a skinny guy without much power, but he was consistent. My brother Steve and I were in the stands the day Rance recorded his last major league hit in 1992. We didn't know it at the time, as there was a good chunk of the season remaining, but it ended up being so and now I can drag out this story every time somebody mentions Rance Mulliniks. And I think we all remember where we were when Domingo Martinez hit his first ever home run. Yes it's true, that day Rance got his last hit a young first baseman named Domingo Martinez got his first homer. Domingo was big and strong and I thought he could one day hit 50. As it turns out, Steve and I witnessed half of his career homers. He retired with 2. And while we're talking Jays, Tom Cheek missed out on the Frick Award again. Did Rance get a ring for 1992? He certainly deserved one, he wasn't the flashiest or the most athletic like you said Mike, but he was a hard working guy who if anything was consistent and you knew you what you were getting from him. Good call...people forget the contribution of this excellent platoon at third base. They focus on Morris, Winfield and, rightfully so, Molitor. But the steady Freddie team at the hot corner really made this team a defensive powerhouse in 1992. Was it Garth's wife who was involved in the Olympic synchronized swimming scandal that still rocks the Toronto sporting world to this day? Or Pat-somebody's wife? Ed Sprague's wife was the synchro swimmer. Mullin-Iorg was(were?) great. That was one of the last good platoons ... gone to way of the dodo bird. Ed Sprague's wife was Kristen Babb-Sprague and the controversy goes back to the '92 Olympics in Barcelona when a scoring scandal erupted and Babb-Sprague got the gold over our very own Sylvie Fréchette. Around this time my high school, Michael Power, was playing the dome in the metro bowl or whatever they call the GTA baseball championship. I was at the game, and Ed Sprague popped out of the bullpen. I then yelled to him "Your wife cheated us, Ed!". I'm sure I shared this story before... if not, I will soon. Ol' #5 was also the first person to hit an inside the park HR at SkyDome, too. That was fun to watch, even on TV. What was the date of the inside the park homerun??? TORONTO (AP) -- Tom Candiotti extended his shutout streak to 15 innings, and John Olerud drove in the decisive run as Toronto beat Texas. Candiotti (9-7), in his third start since a trade from Cleveland, allowed five hits in eight innings and struck out a season-high 10 for the fifth time. The victory, Toronto's fourth straight and 16th in 19 games, gave the American League East leaders 11 shutouts, the best in baseball. 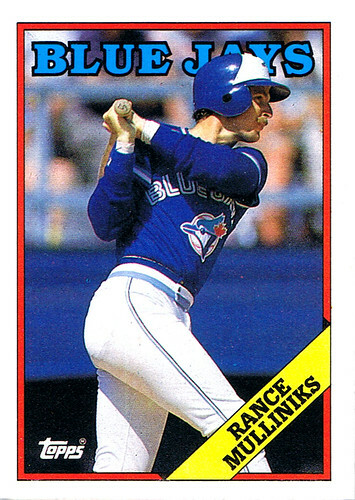 Olerud's r.b.i. single, his third hit, came in the seventh off Kevin Brown (7-7). Rance Mulliniks hit an inside-the-park homer, his second and the first ever at the Skydome, in the eighth. I was at that game! it was the first game I ever went to, I still have the stub!